Plagiarism can be a confusing and overwhelming topic. To learn more about plagiarism and how to avoid it, complete each of the steps below. Plagiarism is when you use another person’s words or ideas and try to pass them off as your own. However, plagiarism can take many different forms. 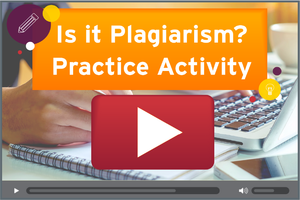 To learn more about what plagiarism is, and why it’s wrong, see our short video on Plagiarism. To learn about each of the types, see the Types of Plagiarism Infographic. Using outside evidence is important in academic writing, but those sources must be used appropriately. You can include information from outside sources through proper paraphrasing and quoting. To learn about these two approaches, see our short video on Paraphrasing and our Quoting, Paraphrasing, and Summarizing page. As noted in Step 2, you can paraphrase and quote pieces of evidence to include information from outside sources. But, all of that information must be cited within your paper using in-text citations and a separate references list. To learn about these two requirements, see our Citing Within Your Paper page and our References List page. It’s always a good idea to use a tool to check that you have properly used outside sources in your work. One tool you can use to help you with this is Turnitin. Turnitin is a tool that helps identify potential plagiarism within a submitted assignment. This tool compares students’ work with texts available online, in our university’s internal database, as well as any assignment submitted to Turnitin. For help understanding your Turnitin report, see our Interpreting a Turnitin Report video. For additional help, see our Did I Plagiarize? Infographic.